Metallurgical and Materials Engineering Department, Indian Institute of Technology, Roorkee. processing technique a nd resulting higher levels of density and improved binding of the product. Keywords: brake pad; heavy duty Aircraft brakes; Powder Metallurgy. applications such as in commercial/fighter aircrafts [3, 4]. 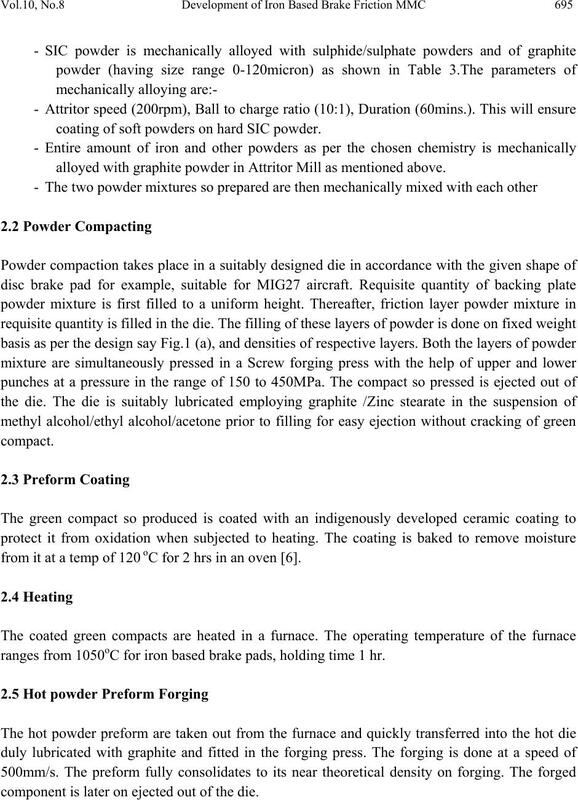 compacting and sintering route . alloying is 2hours and rotational speed of mill is 200 rpm. coating of soft powders on hard SIC powder. alloyed with graphite powder in Attritor Mill as mentioned above. from it at a temp of 120 oC for 2 hrs in an oven . ranges from 1050oC for iron based brake pads, holding time 1 hr. component is later on ejected out of the die. Table 1. 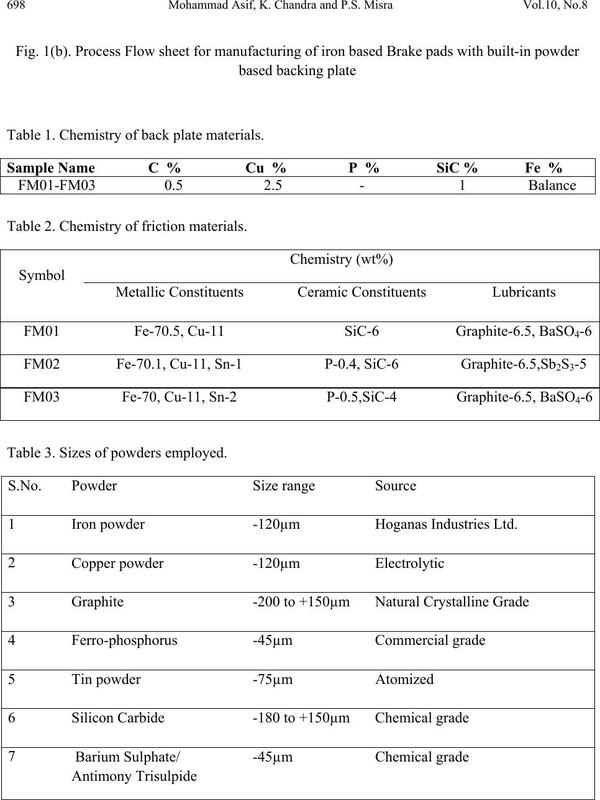 Chemistry of back plate materials. Table 2. 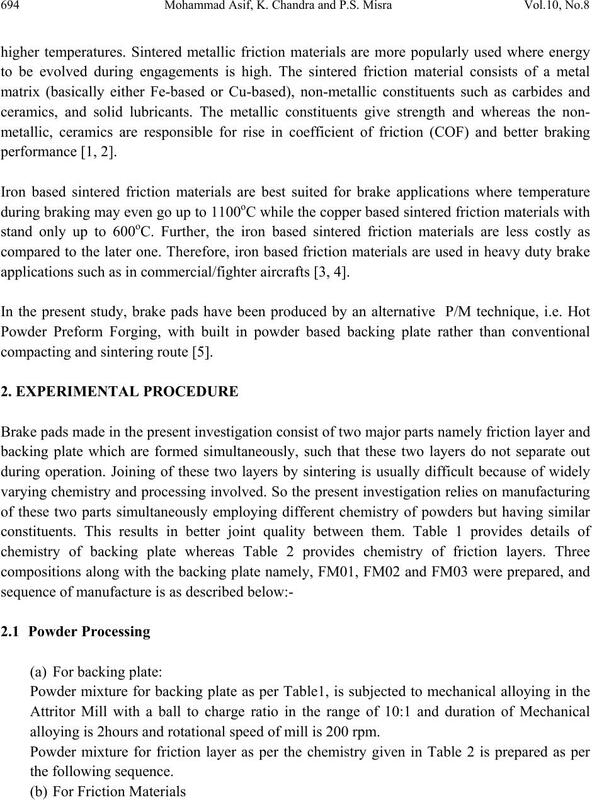 Chemistry of friction materials. 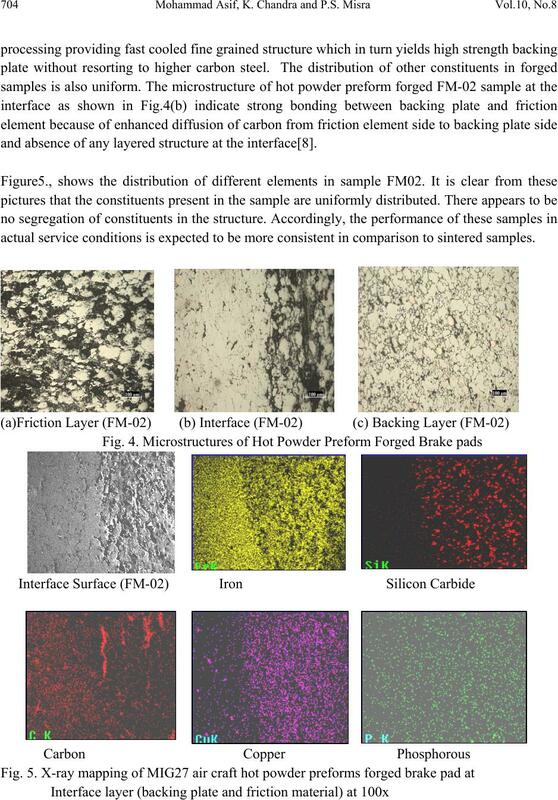 1 Iron powder -120µm Hoganas Industries Ltd.
disc wear test, sub-scale brake inertia dynamometer tests are carried out. Table 4. 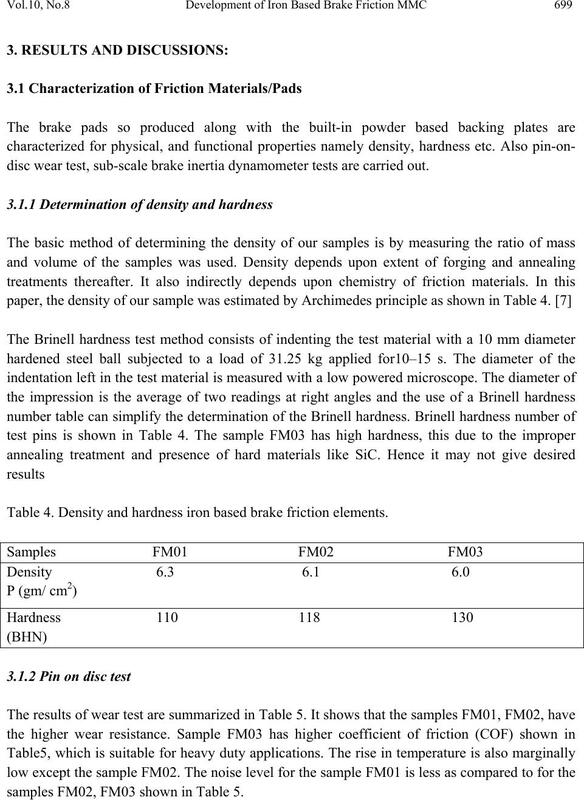 Density and hardness iron based brake friction elements. samples FM02, FM03 shown in Table 5. Table 5. Pin-on-disc wear test results. (contact area of pin: 7×7 mm2 , sliding speed of 9m/s and applied load of 8 kg). Max Min Avg oC Max Min Avg. 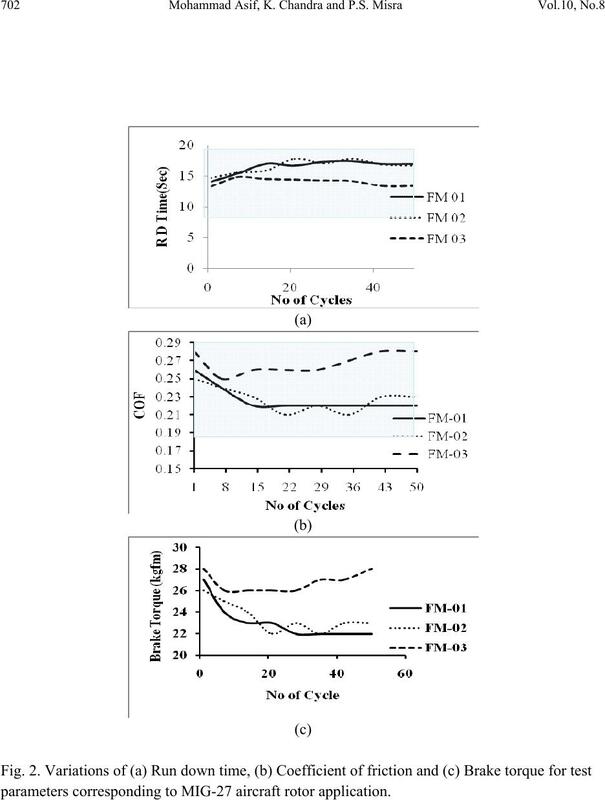 ranges as shown in Table 7. These pads seem to be suitable for MIG27 aircraft rotor applications. hardness and lower density combination. choices to suit this challenging application. Table 6. Test input parameters for mig 27 rotor application. Table 7. 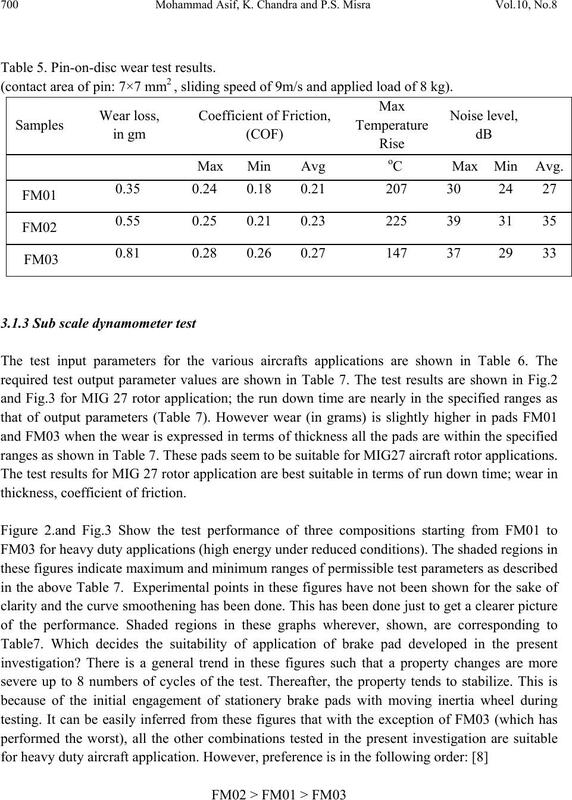 Test output parameters for MIG 27 rotor application. 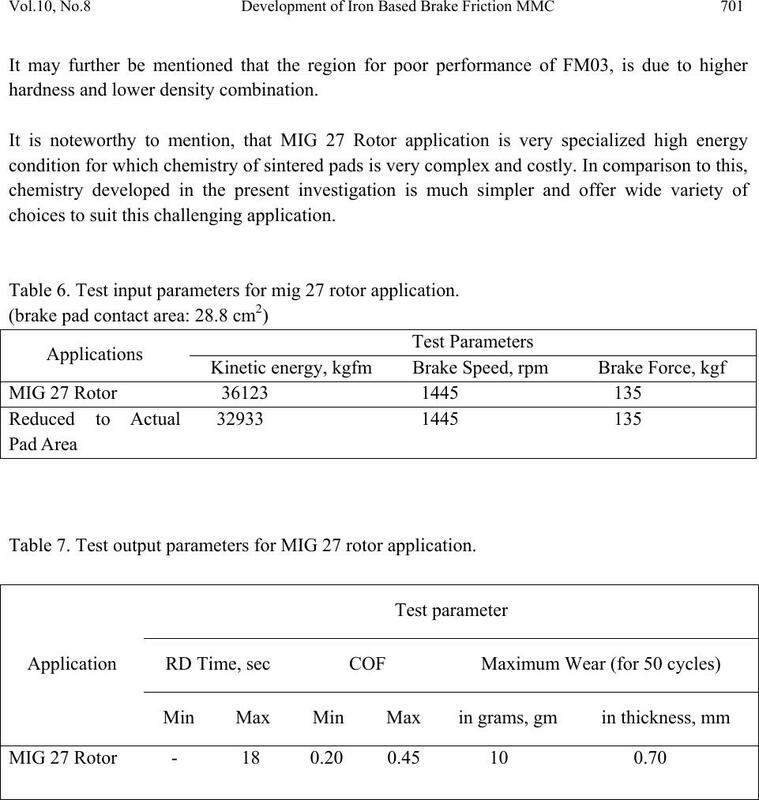 parameters corresponding to MIG-27 aircraft rotor application. 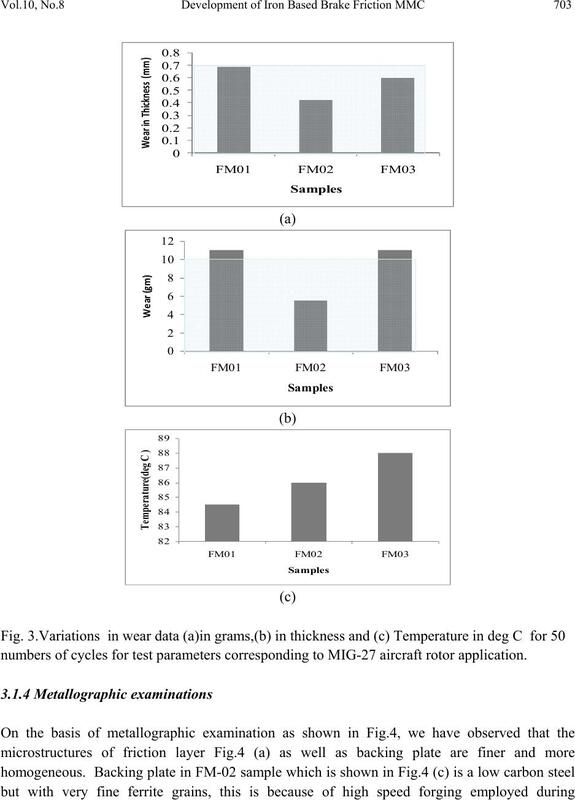 numbers of cycles for test parameters corresponding to MIG-27 aircraft rotor application. and absence of any layered structure at the interface. 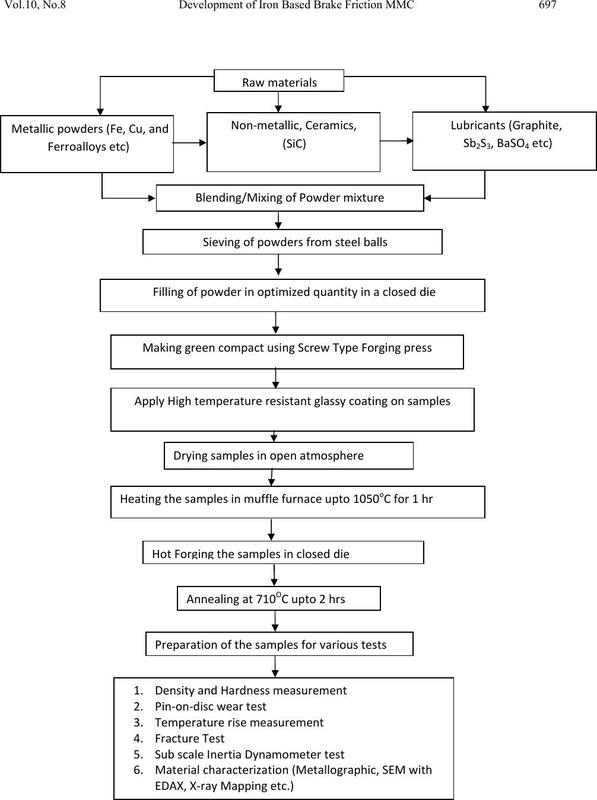 actual service conditions is expected to be more consistent in comparison to sintered samples. iron/copper, based brake pads and protect it from oxidations at high temperature. 4. 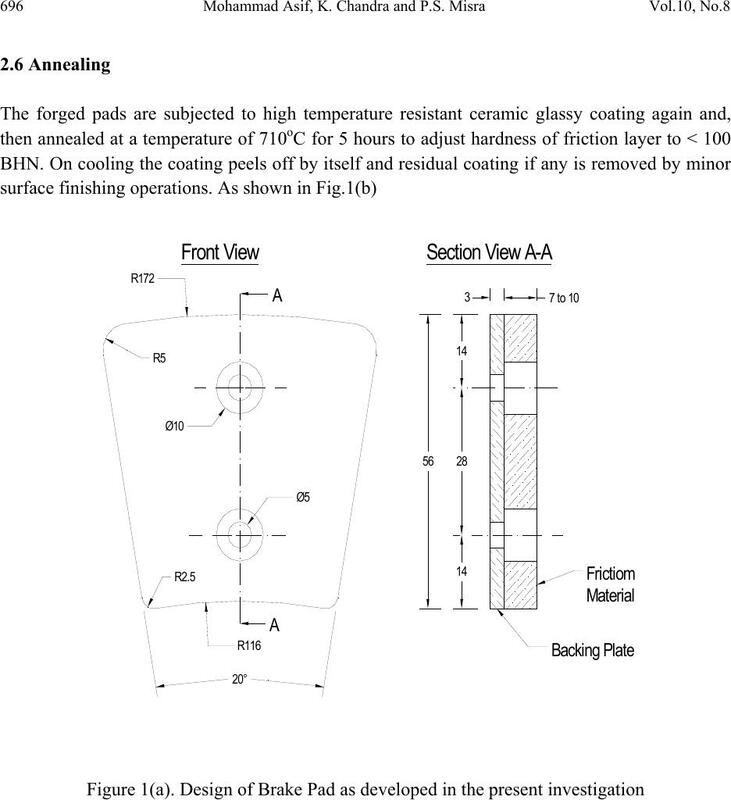 Yields matching quality of the product compared to sintering technology. 5. Easily adoptable by existing P/M industries without any additional cost. samples on their sub-scale dynamometer. Friction and Anti-friction materials, Plenum press, New York. Manufacture of Heavy duty Metallo-Ceramic Brake pads” Powder Metallurgy, p6. 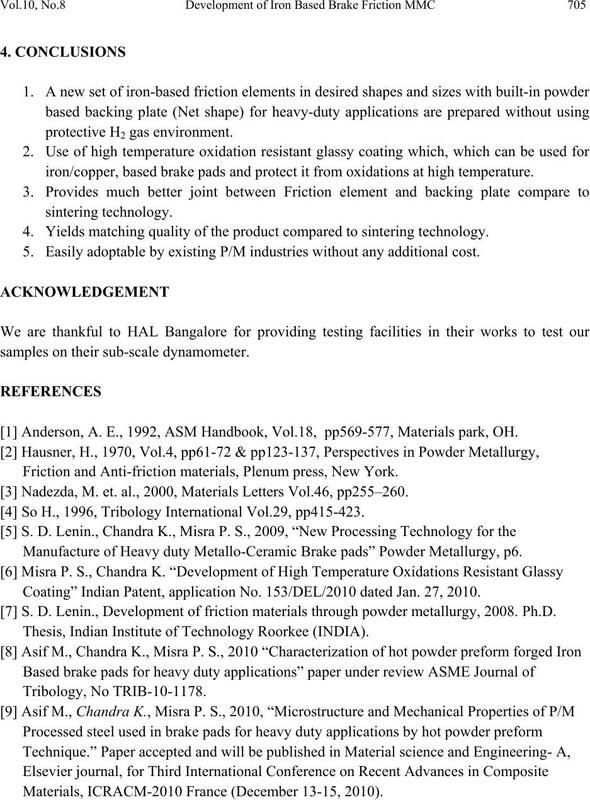 Coating” Indian Patent, application No. 153/DEL/2010 dated Jan. 27, 2010. S. D. Lenin., Development of friction materials through powder metallurgy, 2008. 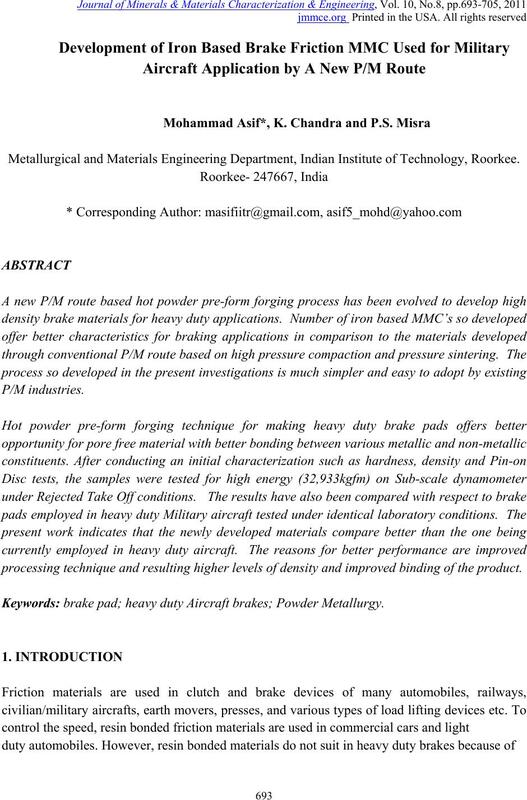 Ph.D.
Thesis, Indian Institute of Technology Roorkee (INDIA). Materials, ICRACM-2010 France (December 13-15, 2010).